Even though the sky was bright, the red filter darkened the sky and also eliminated the effects of atmospheric dispersion. I then changed the scope for a 6" SCT with a 6.3 focal reducer and repeated the exercise, again using a red filter to darken the evening sky and remove atmospheric dispersion. The final mosaic produced by iMerge was then further processed in The Gimp. Click on the image below to see the full-size image. You will have to scroll the image up and down, left and right to see the whole thing. 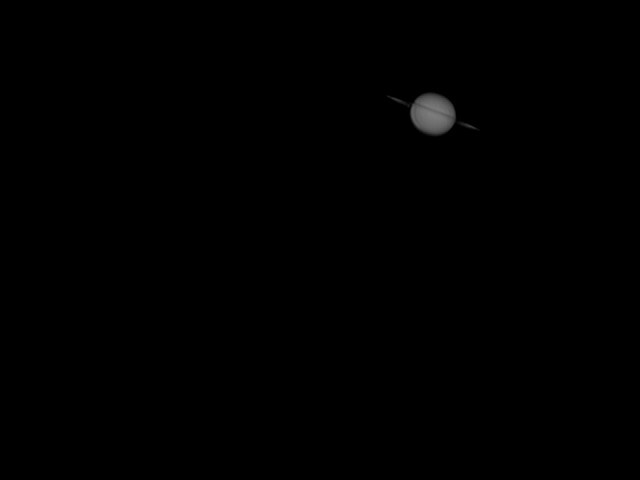 I took a few AVIs of Saturn around 11pm last night. It was taken through my 11" Celestron, DBK 21 camera and a 2.5x barlow. Wayne Jones and I teamed up at Fairwood last night to do some imaging with his Mintron accumulating camera and my Celestron 8SE scope. We got the above results after stacking with Registax and de-noising using GIMP selective Gaussain blur. 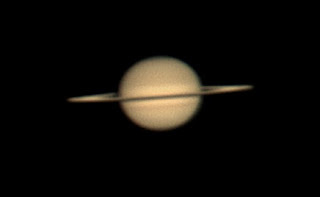 Saturn was taken with a 2x barlow. 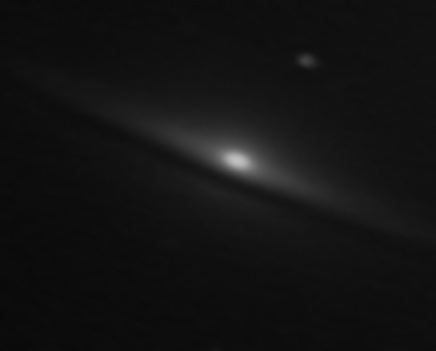 Quite encouraging results for beginning imagers like ourselves! Last night at dusk provided nice views of the crescent Moon with Venus below it. 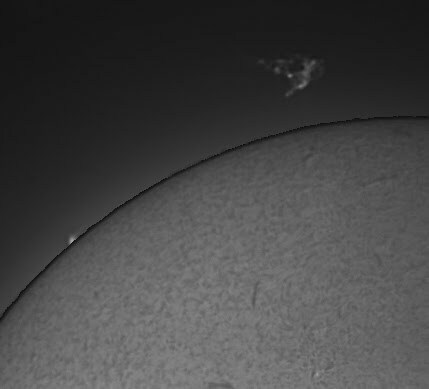 A DMK21 camera was used with a 3x Meade Barlow lens and a H-alpha PST solar scope to capture AVIs exposed for the prominence and the disk separately. This image captured solar disk structure as well as the prominences. 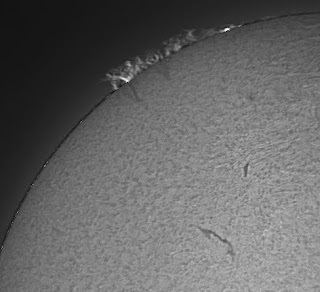 There was little activity on the solar disk with just a few small prominences on the limb. Filaments and surface super granulation can be seen in this image proving that using simple equipment can be worthwhile. After speaking to Steve this morning I was able to image what looks like a detached prominence. Both shots have been sent to Spaceweather. They were taken through my PST, DMK31 (Mono) camera, a 2x then 3x barlow. Seeing conditions were quite poor with thin hazy cloud. Between 9-35 and 9-44am BST I imaged an enormous eruptive prominence that was about a quarter of the diameter of the Sun in size. Within an hour it had largely dissipated. 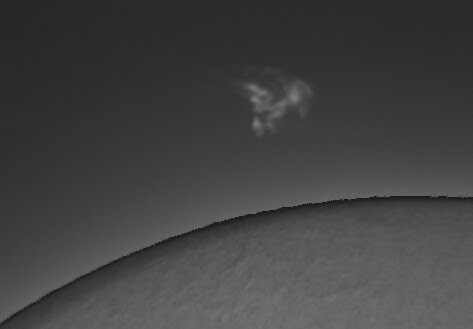 Separate exposures to show the prominence and the solar disk were combined using Andrew Sprott's Solar Layers software. A virtual occultation disk has been placed over the Sun in the right hand image to facilitate viewing the prominence which is fainter than the disk of the Sun. 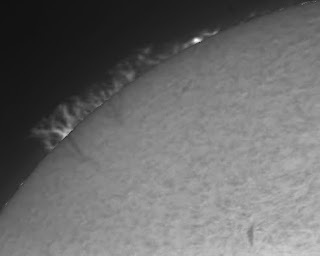 I used a x2 Barlow with the DMK21 camera and a H-alpha PST solar scope to capture this image of a hedgerow prominence. The image comprised 3000 frames exposed for the prominence stacked in Registax and 2000 frames exposed to show the disk, stacked in registax and combined to form a single image with Andrew Sprott's Solar Layers software. In both images filaments can be seen snaking towards the limb where they become prominences.